While Gertrude was at NITI most of the time she spent helping in the kitchen and taking advantage of the time with a personal Bible study on the Book of Jeremiah. The focus of her study was “The Mission Heart of God in the Book of Jeremiah.” If you are interested I am sure she would be happy to share some of her thoughts with you. During the last week of NITI Gertrude was given an opportunity to develop a plan to do a literacy workshop during the next NITI course in February. Everyone was very excited the way things were coming together for it. Please pray that the Lord will raise up the right people to be a part of this. 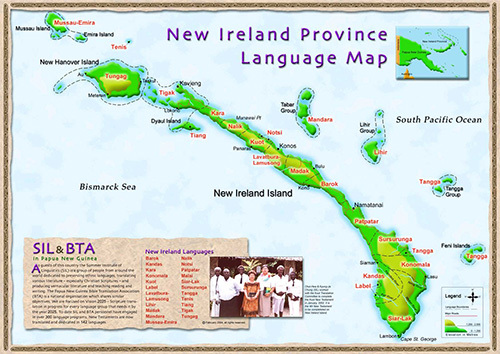 Above is a map of New Ireland Province in Papua New Guinea. We are living in central New Ireland on the east coast with the Notsi people. (I have Notsi circled on the map.) Going to the south is the Papatar people where the NITI courses are held. (That is also circled).